The technique of woodcut and wood engraving printmaking can create large contrasts of light and dark; in this novel, they fill the story with shadows, foreboding, dark characters, ominous encounters and despair. 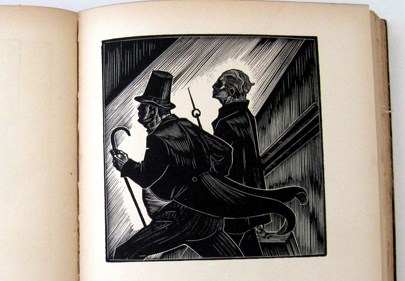 139 wood engravings tell the story of a young artist who journeys to a big city, and signs away his soul to a mysterious stranger who I call the faceless “Top Hat Man”, for a magic paintbrush. The images tell the story of his subsequent isolation, corruption and troubles with life in a big city, and the serious consequences of his bargain with the evil stranger. I couldn’t just flip through the pages; I had to concentrate on each page, as intensely as I used to read a comic book, but without the benefit of the word balloons to give me a hint of what was going on. 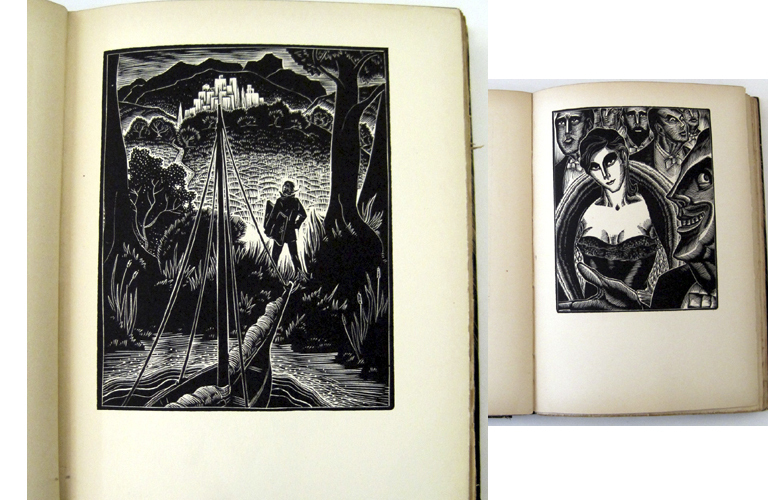 The chapter headings of I: The Brush, II: The Mistress, III: The Brand, IV: The Wife, and finally V: The Portrait, outlines the sequence of events. 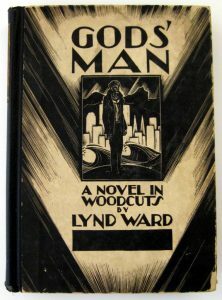 I had the opportunity to attend a curator’s lecture and a documentary film about Lynd Ward at a very timely exhibition “Illustrated by Lynd Ward, From the Collection of Robert Dance” that opened November 19th at The Grolier Club in New York City, an organization devoted to the book arts whose mission is “to foster the study, collecting, and appreciation of books and works on paper, their art, history, production, and commerce”. It was enlightening to learn more about the artist, this novel, and see other works by Lynd Ward on display. The Cooper Hewitt Library collects in the areas of graphic design and book illustration- this is our first wordless,” graphic” novel, and a great addition to our collections.